The Ultimate Volcano Potatoes are fabulous! Who doesn’t love a potato that looks like this? They are as delicious as they look. 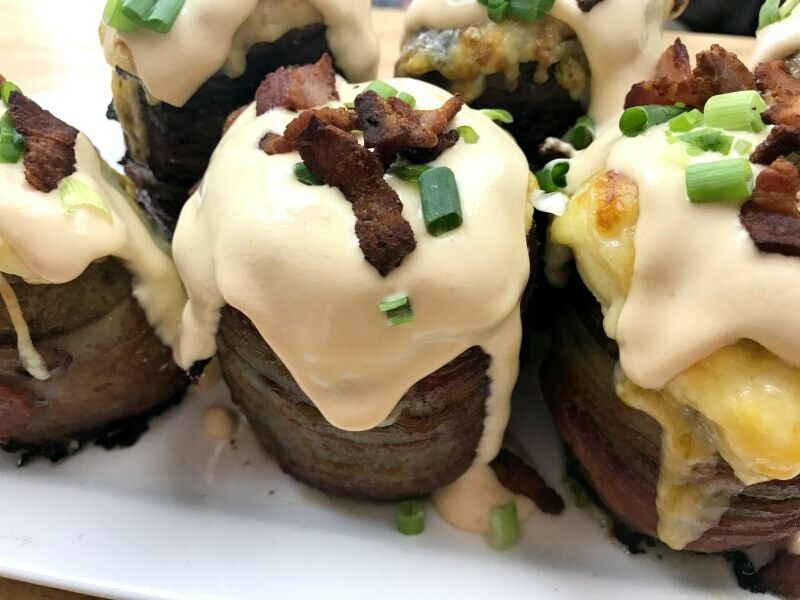 We do not always include cooked bacon, sausage or ham and you really do not have to, these potatoes are yummy either way! This recipe must be on every potato lover’s bucket list! 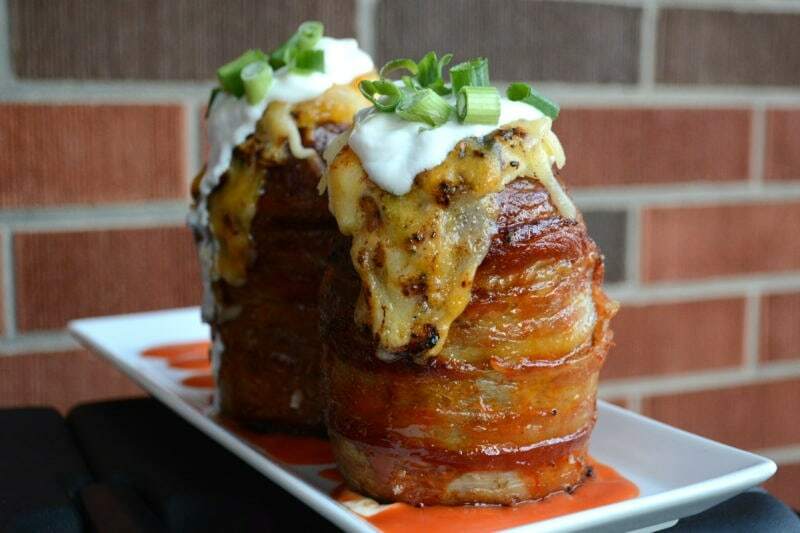 The Ultimate Volcano Potato is as good as it looks! Have a look at our video! Preheat the oven to 400 degrees. Prepare a rimmed baking sheet with tinfoil coated in cooking spray. Wash and dry potatoes. Use a fork to poke several holes all over the potato to allow steam to escape while baking. Cut a slice off of the fattest end of the potato so that you can stand each potato up on a flat surface easily, without wobbling. 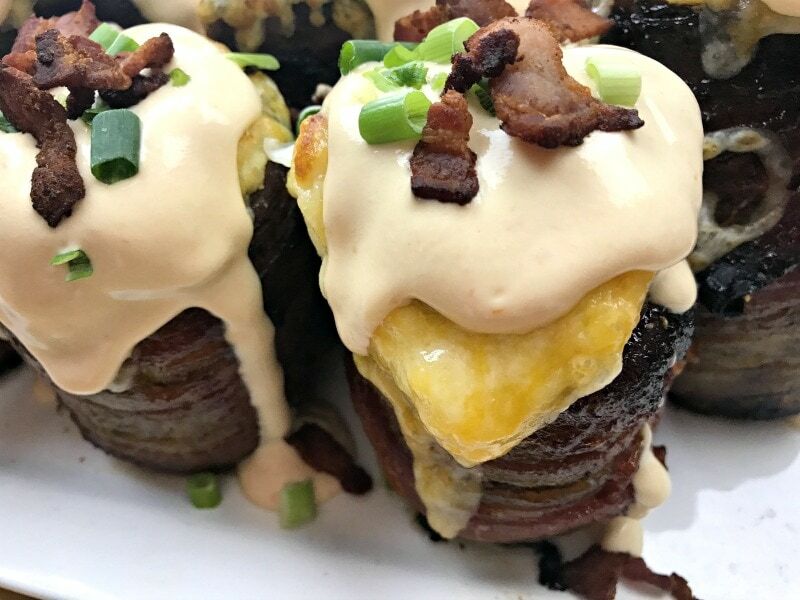 Wrap each raw slice of bacon around the potato, starting at the bottom, using toothpicks to secure the start and end of each piece as it overlaps. Shove toothpicks in your potato about 1/2 inch deep. You should be using 2-3 slices of bacon per potato. Leave about an inch from the top of the potato without bacon. You will be slicing the top off later. Place potatoes on the prepared baking sheet. 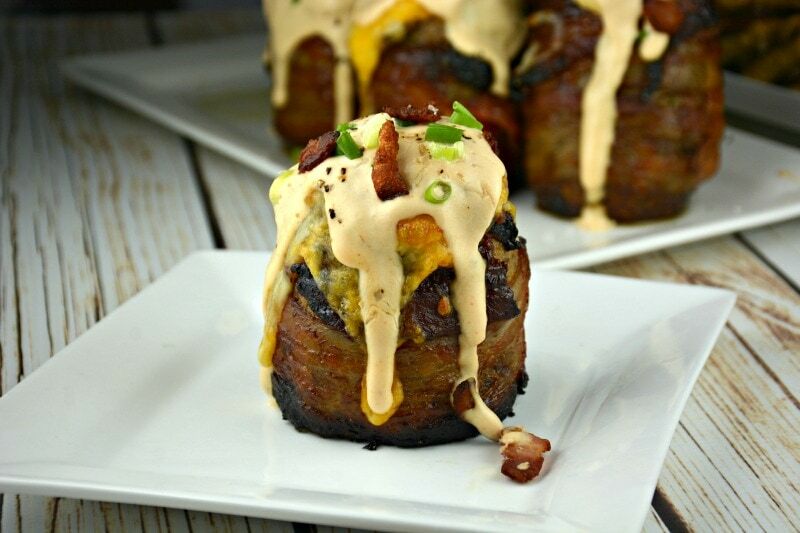 Using a brush add barbecue sauce to each bacon slice, on the sides of the potato. Be generous with the barbecue sauce. Bake for 60-70 minutes in the oven or until potatoes are fork tender. Baste the potatoes a few times with the barbecue sauce while baking. You will be glad you did later! In a small bowl, whisk together sour cream, 2 tablespoons of barbecue sauce (or more or less to taste) and hot sauce (if using) until well combined and chill in the refrigerator until serving. We prefer to purchase a sour cream based flavored dip and add barbecue sauce or just skip this step and just use store bought. It is totally up to you. Remove potatoes from the oven when done and allow them to cool until you are able to handle them, usually 5-10 minutes. Do not turn your oven off yet. Cut a slice off the top of the potato, just above the bacon. Using a spoon carefully scoop out the pulp inside the potato, as deep and as close as you can to the inside edge. Place pulp in a medium sized mixing bowl with 1/4 cup butter. The butter will melt as the scoops of potato pulp land on it in the mixing bowl. If the potato breaks a little while scraping the inside that is ok. The bacon will keep the potato secure. Add diced onions, sour cream, meat and cheeses to the potato pulp. Blend, ideally with a handheld mixer, until contents are smooth. Taste the potato mixture as you go and adjust amounts and ingredients to taste. Dump contents into a re-sealable bag and press into one corner. Cut corner off with scissors, about a 1 inch long cut. Try not to make the hole too big. Squeeze contents back inside the potato. Try to fill the potato up with as much of the potato mixture as possible. Potatoes will pile up on top and overflow and that is ok. Press shredded cheese on top and place potatoes back in the oven to bake or broil until cheese is brown and melted, a few minutes. Remove potatoes from oven and drizzle sour cream mixture on top and even drip down the sides if desired! Top with green onions and serve immediately! I think I need some help. This looked wonderful and seemed easy enough for me. I used large Potatoes wrapped in Bacon and basted at start and about every 10-15 min as well. After 70 min the Bacon was burnt on the outside and Potatoes still hard. Ended up taking bacon off and microwaving potato to get chewy then mixed with filling that would have gone inside. All in all was very tasty, but ugly. Any ideas on the potatoes cooking? I usually microwave or BBQ potatoes and that has worked so far. What kind and size of potatoes do you use in this recipe. A regular Idaho potatoe ? When you say sour cream based dip you mean like onion dip? Anxious to try these. Gonna try it some time this week! I’ll post another comment with my opinion. I’m so excited to try it. Can’t wait to make them they lol look AMAZING!! I can’t wait to try this recipe. In your picture you have placed the potatoes in some kind of red sauce. What is this ? GREAT SPUDS – TO DIE FOR – THANK YOU ! Thanks for stealing my recipe. Love how no credit was even given.